— Plato, or someone who thought it would be funny to credit him with saying this. This must be the year that diamond plating finally goes mainstream… and we can thank the guys at Kotulas. Rugged as a truck box, but lightweight enough to take anywhere. It’s promoed with 3456 cubic inches of storage space, but I Google converted it to 59.8 quarts, so you can compare to other cooler sizes, like the 54 quart Coleman stainless steel cooler, a personal favorite of mine. Quarts or cubics, it will hold plenty of whatever you need to keep cool. 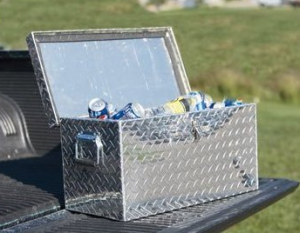 With fully insulated construction it can hold ice for days and with a lockable stainless steel latch and aluminum piano hinge on the lid, it will hold up for much longer than the coolers youve tossed out over the years. is 24in.L x 12in.W x 12in.H, and is featured in this rather amusing YouTube video by the guys at Kotulas.com.